Is your ecommerce website working? Is it successfully selling your products or services? If it was an employee, would you fire it or give it a raise? If you want to learn proven things you can do to get more people to buy from your website, and see the research for yourself, then read on. There are over 1 billion websites (Source: Internet Live Stats) and more than 126.8 million registered .com domain names. (Source: Domain Count Statistics for TLDs). That’s a lot of competition. If your customers don’t like your website there’s always another one (or ten) they can visit instead. The following is all about conversion rate optimization (CRO), how to increase the number of site visitors who buy something. 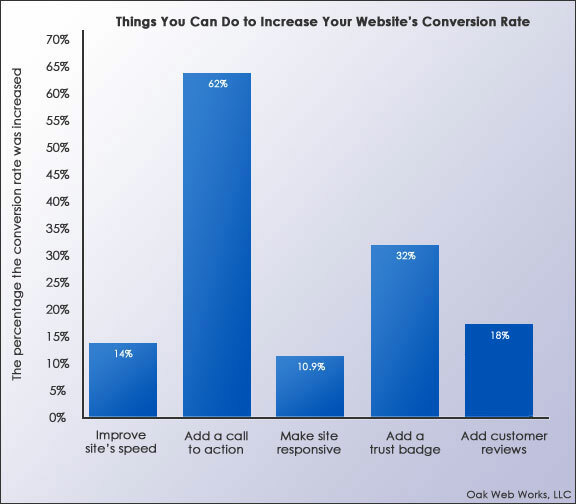 Below is a list of the most important things you can do to improve your site’s conversion rate. Conversion rate is the number of visitors to your website in total, compared to the number that actually buy your products or services. Or more simply, the percentage of website visitors who buy something on your site. Each is supported and justified by a list of studies conducted by industry professionals. Many of the studies listed below have been previously referenced in numerous other articles by web design experts and marketing pros alike. However, here we offer you a more exhaustive list of studies and data that make it crystal clear the specific things you can to do to increase the number of people who buy from your ecommerce website. They run the gamut of major overhauls (responsive website design, increasing site speed) to small tweaks (headlines, trust badges). Whether big or small, all can be implemented immediately, which we recommend you do. In 2015, Elizabeth Sillence, Lesley Fishwick, Pamela Briggs, and Peter Harris conducted a study where they asked subjects to research hypertension on the internet. Subjects were instructed to write why the trusted or distrusted a particular website. If you want customers to buy from your website, you’ll need to be trusted. And a well-designed website is vital for trust. A “well-designed” website (which of course is subjective) means a site that is easy to read and navigate, provides a great user experience, is clear and concise, and has a high conversion rate; essentially a site that people love. >> On Quicksprout, Neil Patel’s awesome marketing site, Neil showed how he increased his conversion rate of his website Crazy Egg by 363%, simply by improving his website. A busy or confusing layout. Too much text without breaks, sub-headlines or images. Frustrating your visitors to no end. Conventional wisdom says to focus on quality content, but if that quality content is hard to read, digest, or difficult to get to, your customers may abandon your site and even distrust your business. Remember, nine out of ten people trust a well-designed website over a poorly designed one. “Responsive” means your website provides an optimal viewing and interaction experience on a wide range of devices, from PCs to mobile devices, like smartphones and iPads. This is accomplished by making the site (using CSS) display or not display certain parts of the site depending on the device the site is being viewed in. For example, a website that has two main columns, one for the sidebar and one for the main content, with responsive design will display both columns when viewed on a PC, but only show one column (and hide the other column, likely the sidebar) when viewed on a smartphone. Clearly, you need a site that’s designed for both PCs and mobile devices. Having a responsive web design will likely increase traffic and improve your website’s conversion rate. Not having a responsive web design will likely frustrate your customers and drive them to your competitors’ websites. 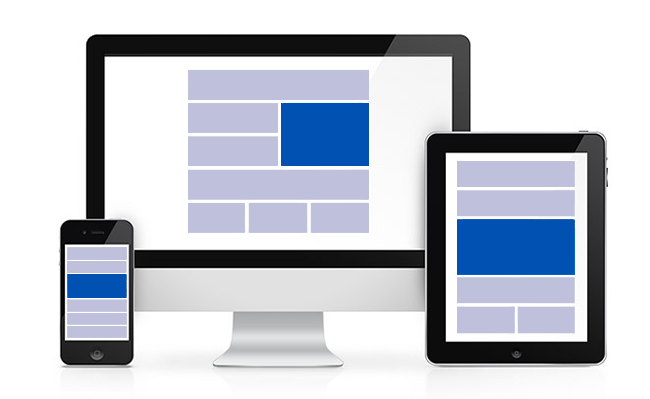 There are several ways to make your website responsive. If you’re using WordPress, you can switch to a responsive theme. If you feel comfortable programming, you could do it yourself. If neither one of those options are possible, you can always hire a reputable and qualified web developer. You’ve heard the phrase “speed kills.” It’s the opposite on the internet. Slow websites kill sales. Amazon found that shaving 100 milliseconds off of load times results in a 1% increase in sales. (Source: Make Data Useful) One percent might not seem like a lot, but with Amazon’s volume, that is huge! So speed is important for Amazon, the nation’s largest internet-based retailer. 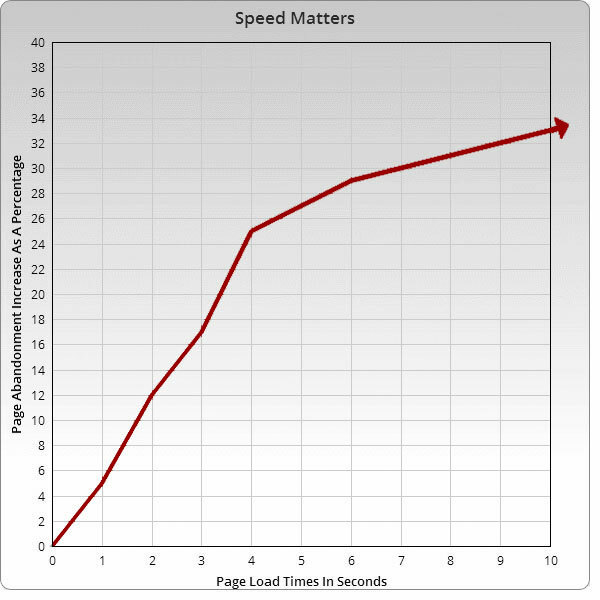 How important is speed for your website? Speed is very important when it comes to making people buy from your website. Your customers do not want to sit through long load times. They want to learn about your products and/or services as fast as possible. >> WebPerformanceToday.com showed that for every 1 second of load speed improvement on Walmart.com, they experienced up to a 2% conversion increase. >> SEO expert Brian Dean of Backlinko in his robust study called ‘We Analyzed 1 Million Google Search Results. Here’s What We Learned About SEO‘ found a strong correlation between site speed and Google rankings. On average, the websites listed in Google’s first nine results (page 1 of the search results) loaded in under 2200 miliseconds. So if you want to rank on page one of Google’s results, you better have a fast-loading site. Basically, when designing your site, “less is more.” If you stick to that philosophy your website will load quickly and your customers will be more inclined to buy. Customers appreciate a fast-loading website. They generally show their appreciation with return visits and higher conversion rates. It behooves you to forgo those long-loading bells and whistles for a streamlined site that’s ready to go within a couple of seconds. Customers are greatly influenced by online reviews. Reviews not only affect what customers buy, or don’t buy, they also help customers form an opinion about your business. 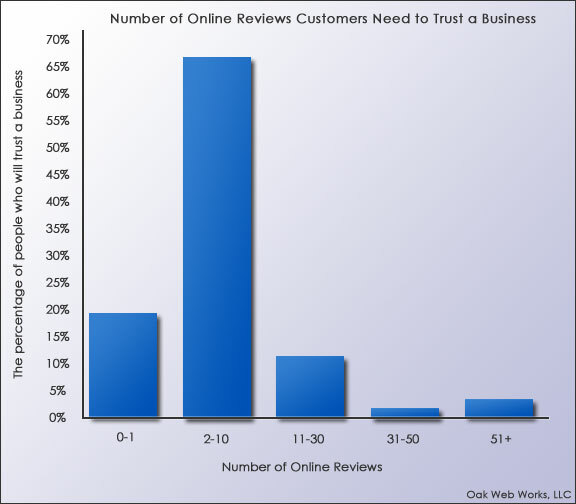 Do you need even more data to convince you of the importance of online reviews? Here you go. Where are your customers reading reviews? Google is the internet’s top source for online reviews. They attract twice as many views as the second place finisher, Amazon. Surprisingly, Wikipedia beat out both Yelp (fourth place) and Trip Advisor (fifth place) for third. Those are single sources. The source that was used the most was actually “none of the above.” It was used by two-thirds (64.2 percent) of the respondents. Since positive online reviews are so important to your website, you’ll want to monitor them frequently. Conduct Google searches on a regular basis but limit your results to just the first two pages. Why? Very few users ever go pass the first page. How Many Pages Do Users Visit When Doing A Google Search? If you find a negative review, use it as an opportunity to write positively about your business. On your blog, a social networking site, or another website altogether, address the negative review by explaining how you fixed the problem or how the review was incorrect in the first place. Or you can see if there is a way for you as the business owner can respond to that negative review within the system the review was created in. To ensure that your business has a sufficient number of positive online reviews start by asking friends and business partners to write some for you. They don’t need to lie or misrepresent themselves. Their reviews should be honest and they should be upfront about their relationship with you and your business. Friends and associates can promote your business through word of mouth so why can’t they do the same in an online review? Don’t ask them to write a positive review. Ask them to write an honest review. For sites like Yelp and Trip Advisor, search the internet for tips and suggestions on how to use them to your business’ benefit. Again, you won’t be doing anything dishonest. Joining and participating in sites like Yelp can actually increase the efficacy of positive online reviews. If possible, you’ll want employees to sign up and be active on review sites too, while representing themselves honestly. Due to the fact that online reviews can be written by anyone, including people who’ve never actually been your customer, there is no way to completely protect your business from negativity. There is, however, a surefire way to help ensure that you’ll business will receive more positive reviews than negative and that’s to provide excellent customer service all the time. Admit it, you just rolled over the buttons above and then realized they were not links, right? Calls to action can be powerful in influencing our behavior. A “call to action” is something you offer, suggest, tell or ask your customers to do. Examples are ‘Buy Now’ or ‘Add to Cart’ buttons, sign up for an e-mail newsletter links or ‘Contact Us’ buttons. You’re calling on your site visitors to take a specific action. Almost all the page on your website should have a clear and obvious call to action. Without it, your visitors won’t know what to do. Surprisingly, a lot of small business websites lack calls to action and their sites would serve them a lot better if they included one on every page. Furthermore, it is advisable to conduct A/B testing with your calls to action to let your site visitors tell you which specific call to action converts the best. >> Redesigning your pricing page can bring 25% more conversions. (Source: Basekit’s Conversions Increased By 25% After Redesigning Pricing Page). Your call to action should be simple, written in the first person, and frequently tested. It’s also very important where you place the call to action. It should be placed somewhere highly visible that makes it’s obvious to your customers what you want them to do. Tell your customers exactly what you want them to do. Make sure your call to action is clickable. Use images in your call to action. Use the words ‘you’ or ‘my’. Don’t have more than one call to action on a page. Your ecommerce website’s first job is to attract relevant visitors. Its second job is to turn those visitors into customers. To do that, you’re going to need an effective and well-placed call to action on every page. Such a call to action will inspire your customers to sign up for your newsletter, read your blog, or best of all, buy your products/services. How does website and your individual web pages make an impression? It starts with your headlines. And each page or article on your site ought to have a compelling main headline. Good headlines separate your website from others and great headlines effectively sell your products and/or services. Headlines also help with social networking and search engine optimization. Furthermore, headlines play a big role in shaping your customers’ first impressions of your website. After all, customers form impressions extremely fast. Therefore, a great headline, one that properly relates to your products and/or services and tells the site visitor that they are in the right place, will go a long way in creating a strong first impression in your customers’ minds. >> Headlines with eight words have the highest click-through rates. They perform 21% better than average. (Source: 5 Tips To Help Improve Your Headline Click-Through Rate). >> Headlines with a colon or hyphen do 9% better (on average) than headlines without a colon or hyphen. (Source: 5 Tips To Help Improve Your Headline Click-Through Rate). When writing a headline for a blog entry or an article, you’ll definitely want to optimize the headline for search engines. This means writing it in a way that will increase your chances of winding up on page one of Google when a customer conducts a search involving your keywords. Furthermore, a great headline for both people and search engines includes conveying to the reader that this article answers their question. Make your headline 65 characters of less. Put your keywords at the front of your title. Your title should be clear; your customers should know exactly what the page is about. Your title should be predictable: when the customer clicks on your title it should take them to a page that meets their expectations. Your title should be evoke emotion. Headlines are extremely important to your website. However there’s no full-proof formula when it comes to writing one. Base your headlines on your business’ goals and satisfying your customers’ needs. You can also use some of the ideas discussed in the studies above such as starting your title with a number, keeping it to eight words, and adding a colon. Finally, remember to test your titles to learn what works best for your site. “Badges? We don’t need no stinkin’ badges!” Even The Three Amigos would agree that your ecommerce store does indeed need badges. There are basically two ways to increase the transaction volume of your website. Increase the number of visitors to your website, or increase the number of visitors who actually buy your products or services (increasing your site’s conversion rate). One of the proven ways to do the latter is to place “trust badges” on your landing pages and checkout page(s). Trust badges are a way to show potential customers that your website is safe and secure. >> In 2014, the Internet Crime Complaint Center received 269,422 fraud complaints. >> 123,684 of those complaints reported a loss. >> In total, over $800,000,000 was lost to internet fraud. Trust badges inspire faith in your business. Customers are less likely to abandon their shopping cart if they see a trust badge on your checkout page. >> 78% of customers say a trust badge indicates that their information is secure. (Source: Trust Seals: E-Commerce Runs on Trust). Trust badges can increase your website’s conversion rate. By showing customers that your site is secure they repay you by buying your goods and services. 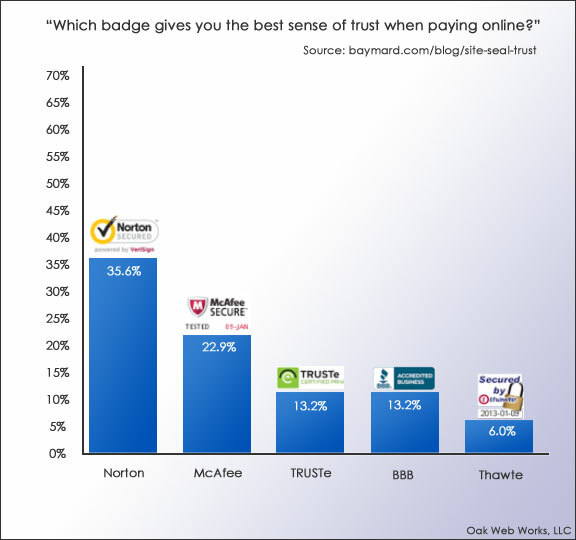 Which badge is the most trusted? Which badge does the public have the least faith in? Your business can also get a venerated trust badge that has nothing to do with security. Third parties award trust badges that indicate your business is honest and dependable. These types of badges are from organizations like the Better Business Bureau and TRUSTe. To purchase one, just conduct a Google search using either “trust badge,” “trust seal,” or the name of the business awarding the trust badge. For a BBB Accredited badge, you’ll need to contact your local BBB chapter. These badges can be quite expensive but since they can increase sales, they can be worth it. After all, a trust badge tells customers that you’re a respectable business and/or that their purchase will be secure. All the aforementioned suggestions are dynamic; they take time to implement, take effect and measure. Don’t forget to measure how effective they are. Continually monitor your efforts over time. Conduct as many tests as you can to see what works and what doesn’t. A/B tests are a great place to start. Finally, keep in mind that our study of studies reveals a couple of truths about your website visitors. 2. The more they trust you, the more likely they will buy from you. If you keep those two things front and center, you’ll succeed in influencing more of your website visitors to make a purchase. Want to learn more useful stuff like this? Sign up for our newsletter.